Bringing in the harvest. Watching for enemy aircraft. Rescuing survivors from the wreckage of bombed houses. Keeping the family business running when parents were enlisted into war-work. These are just a few examples of how children and young people made substantial contributions to the war effort during the Second World War. 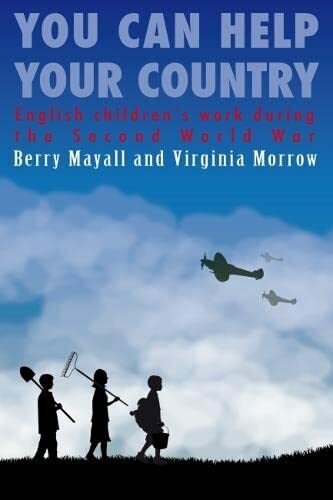 You Can Help Your Country: English children’s work during the Second World War reveals the remarkable, hidden history of children as social agents who actively participated in a national effort during a period of crisis. This highly-illustrated volume draws on interviews with people who were school-age during the war, on archives and on school histories which recorded wartime activities as well as children’s accounts of their experiences at the time. Children expressed both positive and negative views of their work: exhilaration and exhaustion, pride and resentment, delight in new freedoms and anger at deprivation. Applying a sociological approach, the authors outline the social history of childhood during the first half of the twentieth century, documenting heated debates about the ‘proper’ activities of children and analysing the thinking that questioned class-based childhoods and schooling and promoted better health and better educational opportunities. In this context, they examine how children responded to appeals to ‘do their bit’ as urged through government poster campaigns, BBC radio broadcast programmes for schools, propaganda films and children’s fiction. This is a stimulating, entertaining and scholarly contribution to the history of childhood, which will enable the reader to think about ideas of childhood today and their rights, as citizens, to participate in the social and political life of their society. It will be essential reading for academics, researchers and students in the field of educational sociology and more widely, and will appeal to anyone with an interest in social history and war studies. Berry Mayall is Professor of Childhood Studies at the Institute of Education, University of London. She has worked for many years on research projects studying the daily lives of children and their parents.